§ 297-298 General site design standards. § 297-299 Landscaping and tree planting standards. § 297-301 Road and sidewalk requirements in subdivided and unsubdivided developments. § 297-302 Access standards for arterial roads. § 297-303 Utility ownership and easement rights. § 297-304 Utilities to be consistent with internal and external development. § 297-307 Sites for and screening of dumpsters. § 297-308 Public transit accommodations. The purpose of this article is to establish minimum design and improvement standards that will be required for approval of a site plan. The applicant shall submit a site analysis of the characteristics of the development site, such as site context, geology and soil, topography, climate, natural features, visual features, past and present use of the site, historic features, existing vegetation, structures and road networks. The approval of preliminary plans and architectural elevations for all single-family subdivisions in the RL, RM, RH, RO, RR, PRD, MX. PUD, WPC, TOD, PEP, PMH, CER, CRR, CRM, HVC, HVG, and HVR Zones that are greater than 10 lots and within sewer service areas S-1, S-3, S-5. The approval of site plans and buildings for all commercial construction in the CV, CN, CC, CB, BP, IG, IH, CER, CRR, CRM, HVC, HVG, and HVE Zones. All new construction, renovation and expansion projects shall comply with all applicable sections of the commercial and industrial guidelines and standards. Projects that do not add more than 2,000 square feet of gross floor area or alter more than 25% of the building facade or site area are exempt. The guidelines and standards shall conform to appropriate planning principles and to the purposes stated for the specific zone. Editor's Note: This bill also redesignated former Subsections B and C as Subsections C and D, respectively. Design of the development shall take into consideration all existing local and regional plans for the surrounding community. Development of the site shall be based on the site analysis. To the maximum extent practicable, development shall be located to preserve the natural features of the site, to avoid areas of environmental sensitivity and to minimize negative impacts and alteration of natural features. Unique and/or fragile areas, including tidal and nontidal wetlands, as defined in Section 404 of the Federal Water Pollution Control Act Amendments of 1972 and as delineated on wetlands maps prepared by the United States Fish and Wildlife Service, field verified by on-site inspection. Significant trees or stands of trees, defined as the largest known individual trees of each species in the state, large trees approaching the diameter of the known largest tree or species or clumps of trees that are rare to the area or of particular horticultural or landscape value. Steep slopes in excess of 25% as measured over a ten-foot interval, unless appropriate engineering measures concerning slope stability, erosion and safety are taken. Habitats of endangered wildlife, as identified on federal or state lists. Particular attention shall be given to fish spawning areas, rare, threatened or endangered species habitat and other ecologically significant features. Historically significant structures and sites, as listed on federal, state or County lists of historic places. The development shall be designed to mitigate adverse effects of shadow, noise, odor, traffic, drainage and utilities on neighboring properties. Every lot shall have sufficient access to it for emergency vehicles, as well as for those needing access to the property in its intended use. The placement of units in residential developments shall take into consideration topography, privacy, building height, orientation, drainage and aesthetics. Buildings shall be spaced so that adequate privacy is provided for units. Residential structures shall be located and sited to facilitate pedestrian and visual access to common open space whenever possible. Open space intended for a recreation or public use shall be easily accessible to pedestrians. Diversity and originality in layout and individual building design shall be encouraged to achieve the best possible relationships between development and the land. Individual lots, buildings and units shall be arranged and situated to relate to surrounding properties, to improve the view from the view of buildings and to lessen area devoted to motor vehicle access. Individual lots, buildings, units and parking areas shall be situated to avoid the adverse effects of shadows, noise and traffic on the residents of the site. Solar access and conservation of energy shall be encouraged. All developments shall conform to the requirements of Articles XXI and XXII and Appendix E of this chapter. Existing trees shall be preserved wherever possible. The protection of trees six inches or more in diameter (measured diameter at breast height) shall be given high priority in determining the location of open space, structures, underground utilities, walks and paved areas. Areas in which trees are preserved shall remain at original grade level and shall remain undisturbed wherever possible. Where extensive natural tree cover and vegetation does not exist, landscaping shall be provided to enhance the appearance of the development, aid in erosion control, provide protection from wind and sun, screen streets and parking areas and enhance the privacy of dwelling units. Impervious surfaces (surfaces that do not absorb rain, including all buildings, roads, sidewalks, patios, parking areas and any other areas paved in concrete or asphalt) shall not occupy more than the established impervious surface ratio (ISR) contained in the Schedule of Zone Regulations (Articles VI through VIII). Efforts to minimize impervious surfaces shall be encouraged. Within unsubdivided developments, all private roads and accessways shall be designed and constructed to facilitate the safe and convenient movement of motor vehicle and pedestrian traffic. Whenever a road in an unsubdivided development connects two or more subcollector, collector or arterial streets in such a manner that any substantial volume of through traffic is likely to make use of this road, such road shall be constructed in accordance with the standards applicable to subdivision streets and shall be dedicated. In other cases, when roads in unsubdivided developments within the County are constructed in accordance with the specifications for subdivision streets, the County may accept an offer of dedication of such streets. In all unsubdivided residential development, sidewalks shall be provided linking dwelling units with other dwelling units, the public street and on-site activity centers, such as parking areas, laundry facilities and recreational areas and facilities. Driveway and pedestrian connections between adjacent commercial sites, whenever feasible. An application for site plan approval shall install sidewalks and related improvements along public or private roads, or reserve easements for sidewalks, as specified below. For any site within an activity center or core mixed use zone, sidewalks, street trees and streetlights shall be installed along the side of a public or private road abutting the development, or along both sides of a public or private road within the development, if the development meets the thresholds for streetscape improvements established by § 297-96M for the activity center zones. For expansion of existing uses, these improvements shall be installed if required by the Zoning Officer in the core mixed use zones. For commercial, industrial or mixed use development in other zones, sidewalks and street trees shall be installed along the side of public or private roads abutting the development unless the Zoning Officer determines that these improvements are not desirable for pedestrian safety and convenience, and are inconsistent with County plans for the area. A landscape strip shall be provided between the sidewalks and the roads, for pedestrian comfort and security. Where a service road is required, the sidewalks may be provided along the service roads. In other zones, whenever the Zoning Officer finds that pedestrian access is necessary from an unsubdivided development to schools, parks, playgrounds or other roads or facilities, and that such access is not conveniently provided by sidewalks adjacent to the roads, the applicant may be required to reserve an unobstructed easement of at least 10 feet to provide such access. Sidewalks along public streets shall meet the standards of the Road Ordinance and adopted design guidelines. In the Hughesville Village Zone, in addition to sidewalks and street trees, streetlights shall be installed as required by § 297-99. Such walkways could be more environmentally desirable or more in keeping with the overall design of the development. At least four feet wide. Wider sidewalks or walkways may be required based upon design guidelines adopted by the County Commissioners for the particular zone or land use. The proposed right-of-way of public roads abutting or within the site shall be shown on site plans. Required setbacks shall be measured from the proposed right-of-way. Landscaping, parking and other required improvements shall be located outside of the proposed right-of-way. All proposed development or redevelopment projects in the urban core, designated by the Comprehensive Plan, shall be designed to minimize left turn movements or conflicts on the site and in the street. Driveways shall be designed to achieve clear sight lines. Where reasonable access is available, the vehicular access to the site should be arranged to avoid traffic use of local residential streets situated in or bordered by residential zones. Access driveways should be designed with sufficient capacity to avoid queuing of entering vehicles on any road or street. One driveway connection from any site or lot to any street shall be preferable, except where separate entrances and exit driveways may be necessary to safeguard against hazards and to avoid congestion. Additional driveways should also be considered for large tracts and uses of extensive scope, if traffic flow on adjacent roads will be facilitated by the additional connections. Each access driveway shall be located and designed so as to cause the least practical interference with the use of adjacent property and with the movement of pedestrian or vehicular traffic. Where a site or lot has frontage on two or more roads, the access to the site should generally be provided to the site from the lower classified road, unless there is less potential for traffic congestion and for hazards to traffic and pedestrian movement from the higher classified road. Where necessary to safeguard against hazards to traffic and pedestrians or to avoid traffic congestion, provisions shall be made for turning lanes, traffic directional islands, service roads, driveways and controls within the road. Circulation driveways are encouraged to minimize excess curb cuts and driveways and to preserve existing capacity of arterial highways. Where topographic and other conditions offer no major impediments, provision should be made for circulation driveway connections to adjoining lots of similar existing or potential use to facilitate fire protection services and to enable the public to travel between two existing or potential uses without the need to travel upon a street. When a site is developed or redeveloped in the HC Zone in excess of the maximum standards of this chapter, driveways shall be eliminated or relocated when possible to achieve these objectives. A minimum of 17 feet for all one-way driveways. One-way driveways shall not exceed 20 feet. A minimum of 25 feet for all two-way driveways. Two-way driveways shall not exceed 35 feet. Existing curb openings or driveway approaches that are no longer required due to new driveway approach construction on the same lot or due to the combined use of driveways/access points shall be removed, and new curb, gutter and sidewalk shall be installed to match the existing. Such work shall be completed along with the installation of the new driveway approaches. For any undeveloped parcel within the HC Zone, sufficient easement shall be preserved for the provision of a service drive, to be constructed at a future date, which would link adjacent developments and reduce the number of access points onto the corridor. The Planning Commission reserves the right to determine those parcels to be affected by such service road easement, and the location of the easement shall be indicated on a right-of-way map recorded in the County's land records. In any case in which an applicant installs or causes the installation of water, sewer, electrical power, telephone or cable television facilities and intends that such facilities shall be owned, operated or maintained by a public utility or any entity other than the applicant, the applicant shall transfer to such utility or entity the necessary ownership or easement rights to enable the utility or entity to operate and maintain such facilities. Whenever it can reasonably be anticipated that utility facilities constructed in one development will be extended to serve other adjacent or nearby developments, such utility facilities (e.g., water or sewer lines) shall be located and constructed so that extensions can be made conveniently and without undue burden or expense or unnecessary duplication of service. All entrances and exits in buildings used for nonresidential purposes and in two-family or multifamily residential developments containing more than four dwelling units shall be adequately lighted to ensure the safety of persons and the security of the buildings. Excessive illumination. Lighting within any lot that unnecessarily illuminates any other lot and substantially interferes with the use or enjoyment of such other lot is prohibited. Lighting unnecessarily illuminates another lot if it exceeds the standard set forth in § 297-306. Site lighting shall be of low intensity from a concealed source, shall be of a clear white light which does not distort colors and shall not spill over into adjoining properties, buffers, roadways or in any way interfere with the vision of oncoming motorists. This section does not apply to public streetlighting. 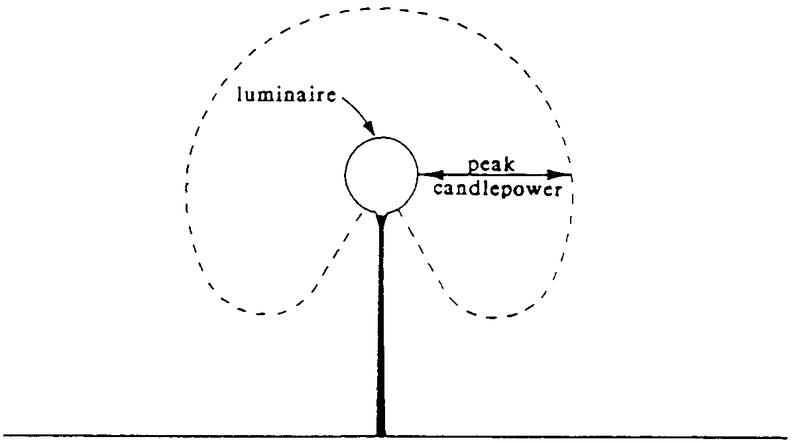 An illustration of this type of luminaire is shown on Figure XVIII-1 below. 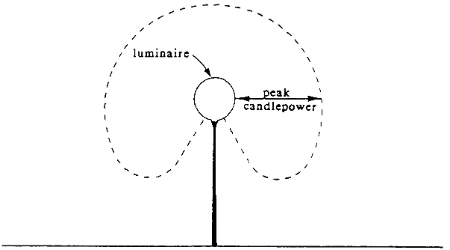 An illustration of this type of luminaire is provided on Figure XVIII-1. Lighting of outdoor recreational uses shall not exceed a maximum post height of 40 feet. 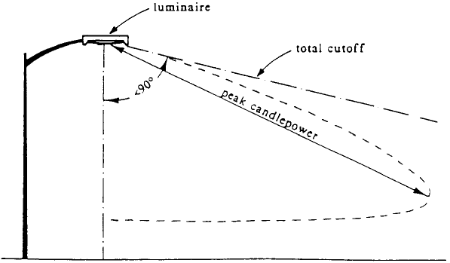 Lighting of outdoor recreational uses may exceed a total cutoff angle of 90°, provided that the luminaire is shielded in either its orientation or by a landscaped buffer yard to prevent light and glare spillover to adjacent residential property. The maximum permitted illumination at the interior buffer yard line shall not exceed two footcandles. No flickering or flashing lights shall be permitted. Light sources or luminaires shall not be located within buffer yard areas except on pedestrian walkways. 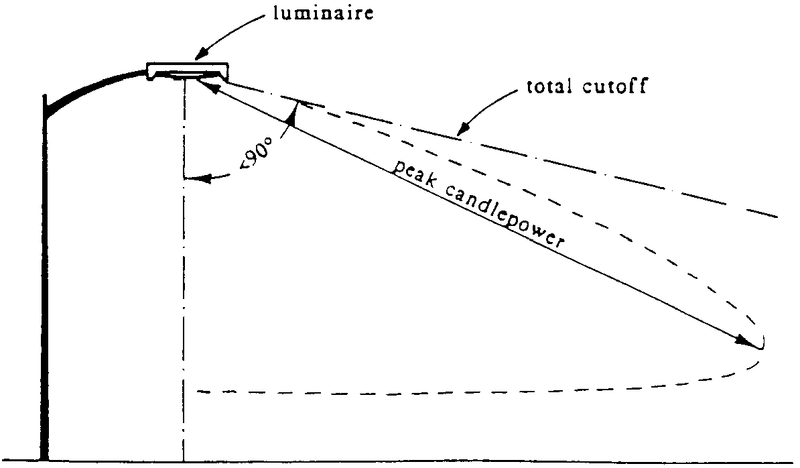 Exterior lighting plan. At the time any exterior light is installed or substantially modified and whenever a zoning permit is sought, an exterior lighting plan shall be submitted to the Zoning Officer in order to determine whether the requirements of this section have been met and that adjoining property will not be adversely impacted by the proposed lighting. Every new development constructed that is or will be required to provide one or more dumpsters for solid waste collection shall provide sites for such dumpsters that are located so as to facilitate collection and minimize any negative impact on persons occupying the development site, neighboring properties or public rights-of-way. Persons in any dwelling unit on residential property other than that where the dumpster is located. Occupants, customers or employees in any building on nonresidential property other than that where the dumpster is located, unless such other property is located in an IG or IH Zone. Persons traveling on any public street, sidewalk or other public way. The development is located in the CV Zone and constitutes either a change in use or a major site plan for a structure greater than 5,000 square feet. All applicable developments shall designate an area within the development which will, upon request of the County, become a transit stop for a bus and/or van.